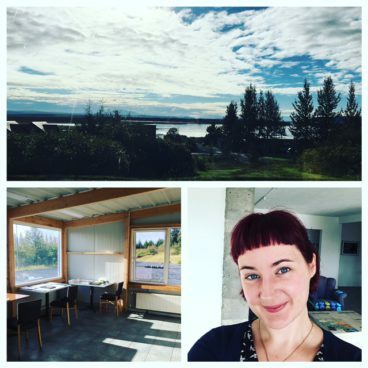 Step 2: Get settled in to the cabin and studio at Gullkistan, the artist residency (the name comes from a legend about a chest of gold hidden on Hekla, the active volcano visible from the front window). On the first morning, be woken by a herd of dozens of horses galloping along the main road. After the horses pass, there is utter silence. Make strong coffee, watch the sun rise over the lake, then get to work. Step 3: Meet Alda and Kristveig, who run Gullkistan, as well as the other artists: Gab the Australian puppeteer, John the American sculptor, Lucie the Canadian choreographer, and Aoi the Japanese painter. Step 4: Go with Gab and John to the local outdoor swimming pool, which is warm even though it’s September because the water is from the hot spring-heated lake. Swim 50 laps a day, then pop into the steam room and three hot tubs (all heated by the hot springs) where you learn about mushrooms from Gab (it turns out she’s into mycology as well as puppetry). Discover that swimming outside during a storm is one of the best and scariest and most freeing things in the world. Step 5: Write obsessively into the night, alone in the darkened studio, and then be so freaked out by your own creepy stories that you have to run (not walk) the ten feet between the studio and the cabin, lit by the wavering light of your phone torch. Feel so haunted by your own stories that you triple-check the front door is locked, though you know the likelihood of an axe-wielding murderer descending on your little cabin in Laugarvatn is basically zero. Step 6: Go on a road trip with Gab and John to visit the boiling-water eruption at Geysir, the waterfall at Gullfoss, and a sudden black-sand beach that doesn’t seem to have a name. Among endless miles of natural beauty, discover an abandoned bin lorry, which Gab climbs to look inside – she claims that it doesn’t contain zombies, but you don’t follow her to check. 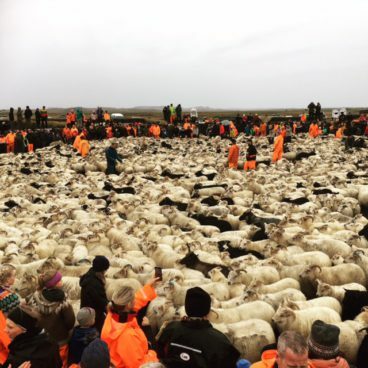 Step 7: Attend rettir, the annual sheep-sorting, where the sheep are gathered in from the hills where they graze together all summer so that the farmers can take them inside for the winter (in Iceland, winter is very cold indeed, even if you have a natural woolly jumper). Afterwards go to the tomato farm to consume more freshly made all-you-can-eat tomato soup than you thought possible. Step 8: Go for long after-lunch walks while listening to horror podcasts. 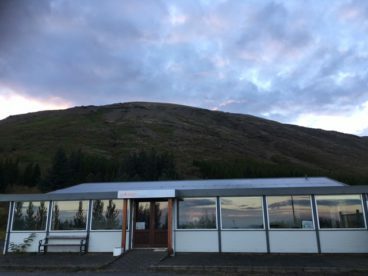 As Laugarvatn consists solely of some houses, a school, two shops and a leisure centre hugging the main road that runs all the way around the edge of Iceland, the one road means only two ways to walk: right or left. You usually choose left as it goes past one field with a horse and one with some cows (all the other fields are empty). Walk for an hour and pass only two farmhouses, then finally turn back without getting in sight of the next town. 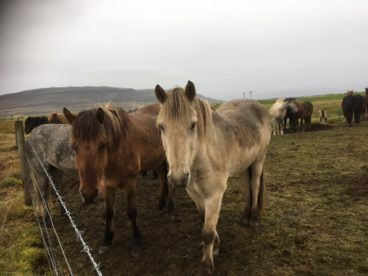 Add a frame narrative to your story-collection-in-progress about a writer on a remote residency in Iceland who slowly loses her mind when she finds that the people in the town begin to disappear so that she is the only one left. Hope that it will remain fiction. Step 9: Answer the ringing phone at midnight; it’s Kristveig, telling you to quickly go outside as the northern lights have decided to visit. Grab all the artists you can find and your duvets (even in September, Iceland at night is very cold) and sit out on the grass, watching the unearthly green-pink-purple lights flit and throb across the sky for hours. Step 10: Over the course of a month manage to lose your mind and then find it again, climb volcanoes and swim in hot springs, write stories weirder and darker and more magical than you could ever have come up with at home, and let Iceland seep into your blood and bones in a way that you know you will never manage to put into words, although you know you will never stop trying. 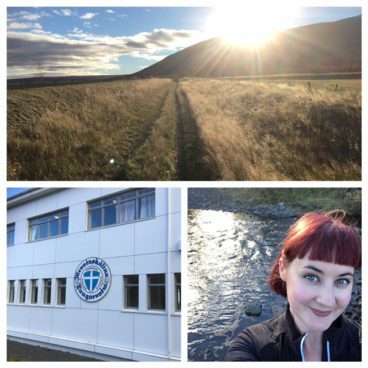 The stories Kirsty wrote in Iceland will be included in the collection The Night Tender. 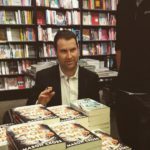 Excerpts from it are upcoming in F(r)iction, Banshee Lit, The Puritan, and on BBC Radio 3. All photographs in this article are by Kirsty Logan. We’re also delighted to present a preview of The Gloaming, the forthcoming novel from Kirsty Logan, here on Books from Scotland. A tale of love and grief, and the gap between fairy tales and real life, The Gloaming is set on a remote island that slowly turns its inhabitants to stone.